Applications are now being now accepted for the English Learner Leadership & Legacy Initiative (ELLLI) EL Advocacy Institute in San Jose, August 3-6, 2018. Applications accepted: until April 27th, 2018. Awards will be announced in early May. Are you a mid-career activist and advocate for the best education for all English Learners (ELs)? Looking to learn new skills, learn about the legacy of EL advocacy in California and join a community of other EL advocates? Californians Together, in collaboration with CABE, invites applicants to an extraordinary, four-day professional development event for selected leaders and advocates for quality education for English Learners. This is a fully-funded event (materials, meals, lodging), with support available as needed for transportation. Applications will be competitive, as there is capacity for the award of only 50 scholarships. You will experience a four-day institute (noon Friday through noon Monday). Participants must commit to attending all four days. The institute includes presentations, discussions, case studies, film and hands-on activities that will further develop your understanding of the history and current context of EL education in California. The Institute aims to provide skills in planning and implementing advocacy campaigns, and to connect advocates to a growing community of EL advocates. WHERE: The EL Advocacy Institute will take place at the beautiful Dolce Hayes Mansion Conference Center in San Jose. Lodging is in spacious double rooms. Pool and exercise facilities are available. WHEN: Attendance is required at all daytime and evening events from noon, Friday, August 3 through noon, Monday, August 6, 2018. Five or more years experience with EL education, in Pre-K through H.S. settings, in IHEs, or in community or advocacy organizations. Some prior engagement in leadership and advocacy for EL education (e.g., CABE chapter, school, district, or county level, or non-governmental organization). Those admitted into the institute will receive all materials, lodging (double occupancy) and meals during the institute, and will be reimbursed for flights or ground transportation up to $300 each. Attendance will be fully funded for the most qualified individuals selected from among all applicants. Those who complete the four days will become ELLLI Partners, and will join an expanding ELLLI community, along with veteran EL advocates and mentors in our efforts to impact state-wide policy and practice in fostering quality education for English Learners. All applications must be submitted on-line. No paper applications can be accepted. Application deadline: April 27th, 2018, 5:00 PM.The Sobrato Family Foundation has provided generous support for ELLLI. Additional support for has come from the Stuart Foundation, the Heising-Simons Foundation and scores of individual donors. Californians Together is a statewide advocacy coalition of powerful organizations from all segments of the education community including: teachers, administrators, board members, parents and civil rights non-profit groups. Our member organizations come together, united around the goal of better educating the almost 1.4 million English Learners by improving California’s schools and promoting equitable educational policy. LOS ANGELES, March 26, 2018 – L.A. Unified has been selected to receive the Californians Together 2018 Multiple Pathways to Biliteracy District Recognition Award. The award celebrates districts that are leading the way to world-class language education in preschool through 12th grade. The award ceremony will be held at the 2018 CABE Conference on March 30, 2018 at the Seal of Excellence Banquet which begins at 7:00 pm in the Sacramento Convention Center. “We hope to inspire the development of strong dual language programs, multiple opportunities and comprehensive pathways enabling all students to reach the goal of high levels of proficiency in two or more languages, fully qualified to earn the Seal of Biliteracy” explained Magaly Lavadenz, President of Californians Together. L.A. Unified has a long history of supporting biliteracy and multilingualism including the unanimous passage of the “Establishing a Commitment to Biliteracy for All” Resolution that sets the establishment of a task force to research the goal of biliteracy upon graduation for students entering kindergarten and supporting the expansion of dual-language programs. L.A. Unified’s commitment to biliteracy is demonstrated by its many pathways. Currently, the District offers 101 Dual Language programs in Spanish Mandarin, Korean, French Armenian and Arabic. Next year an additional 35 Dual Language programs will be added. The District also offers (K-5) Maintenance Bilingual (K-5) programs (K-5), Native Speaker (7-12) courses and World Language programs (6-12). Hilda Maldonado, Executive Director of the Multilingual and Multicultural Department describes the district’s goal as consistent with the Board’s vision to both promote bilingualism and serve historically underserved populations such as English Learners. To support the District’s vision and goals, comprehensive plans have been developed to expand Dual Language and World Language programs and to increase the number of students who are recognized through the Biliteracy Awards, both the L.A. Unified Seal of Biliteracy and the California Seal of Biliteracy. 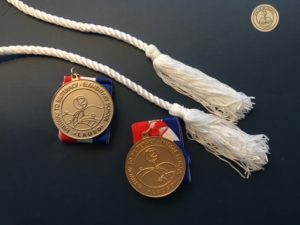 The district has offered the Seal for 8 years, and in 2016-17 offered its own Seal to 3257 students and the California Seal award to 3112 students. To ensure that a strong teaching force is available to support the increasing number of bilingual and biliteracy programs the district has developed career ladder programs that support teacher assistants, paraprofessionals and interns to receive the bilingual authorization which in the 2017-18 school year expanded to include a 60 member cohort. In addition to a “grow our own” philosophy, the district has also made the recruitment of multilingual teachers a priority. The publication, The California Campaign for Biliteracy, published by Californians Together provides details on the campaign whose goal is that California be an example for the nation in preparing students for college and the careers of the future. 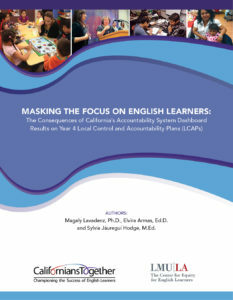 The publication provides guidance for districts to develop comprehensive language programs, and describes award eligibility criteria. Californians Together is a statewide advocacy coalition of powerful organizations from all segments of the education community including teachers, administrators, board members, parents and civil rights non-profit groups. Our member organizations come together around the goal of better educating 1.3 million English Learners by improving California’s schools and promoting equitable educational policy.